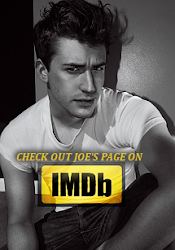 Love Joe Mazzello: First Kiss was a fan favorite at the Catalina Film Festival! First Kiss was a fan favorite at the Catalina Film Festival! This past weekend, First Kiss played at the Catalina Film Festival. It was named a fan favorite by PressLA.com! Beyond documentaries, the festival also serves as a hub for independent filmmakers and screenwriters. Highlighting both shorts and full-length features, the festival saw the world premiere of the comedic short First Kiss, a fan favorite throughout the weekend. Although only four minutes long the film tells the trials and tribulations of a couple that just can’t seem to get to the first kiss, the results are unexpected and hilarious. The festival response for First Kiss has been very positive! I can't wait to finally see this short film. It should be released online soon. You can also check out an interview with First Kiss director Charles Hood on the red carpet of the Catalina Film Festival here! Joe is filming a new movie called "Dear Sidewalk"
GI Joe Retaliation is completed!